I finished this crochet dotted edge throw over the weekend and I’m excited to send it off this week to my good friend Whitney for her upcoming birthday. Whitney is one of the amazing friends I met when I had to move to a new high school right before my senior year. I wasn’t really expecting to make any friends that year, but Whitney and I ended up sharing a lot of classes and carpooling to school and working at the same restaurant and it wasn’t long before she became one of my closest friends. When we graduated Whitney surprised me by making me an awesome t-shirt quilt with a bunch of t-shirts from my childhood – she had my mom sneak them out of my room and I was so surprised when she showed up with the quilt on our last week of school! I still have the quilt and I had the thought a few months ago that this year marks 10 years since we graduated and it’s taken me a decade, but I finally have acquired some crafty skills to be able to pay her back, so I decided to make her a throw for her birthday :). 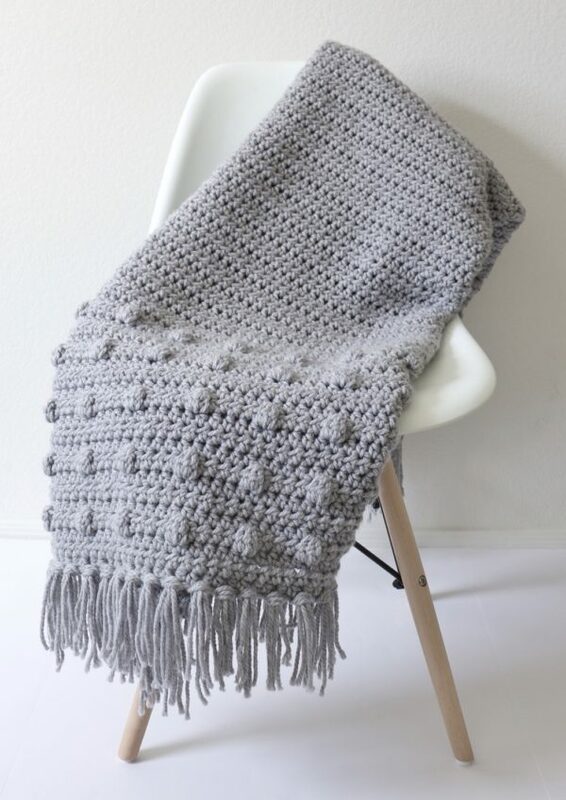 The inspiration for this blanket comes from a really cool bedspread I saw from Urban Outfitters a while ago. Since I wanted to keep the color neutral to match the decor of her house, I thought the evenly spaced polka dots on each end would add a little extra pizzazz. 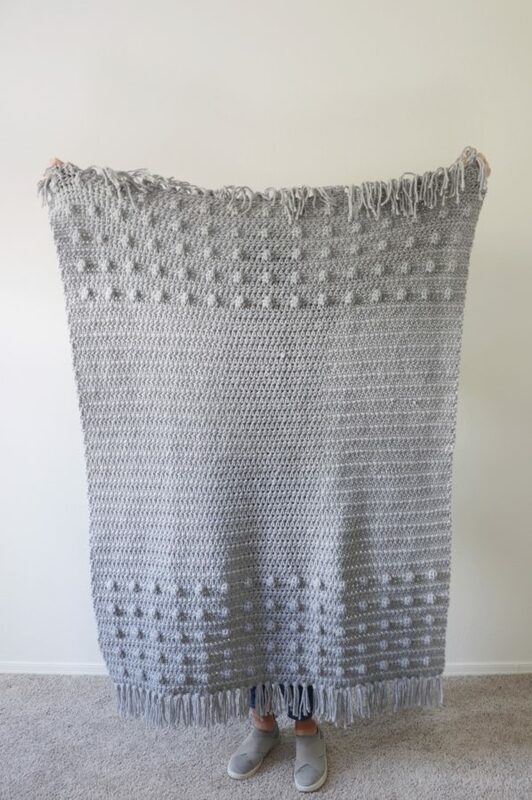 This was my first time using Bernat Softee Chunky yarn for a blanket, and I really loved how fast it worked up and how soft and squishy the blanket turned out! 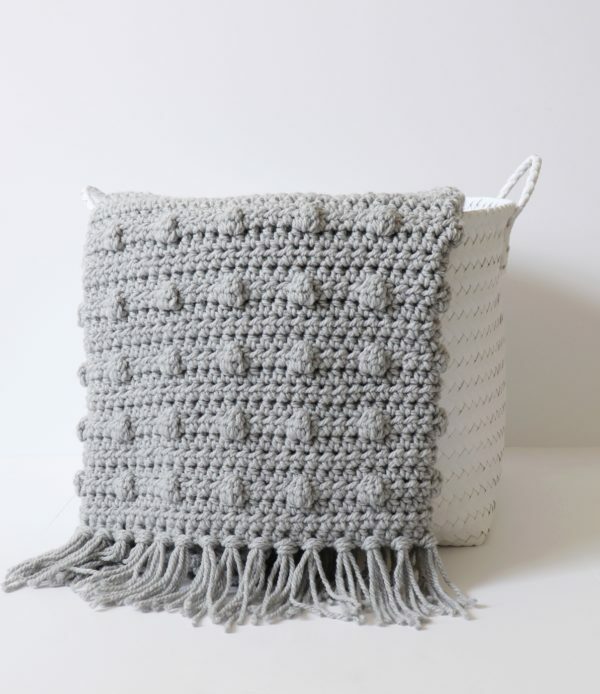 It’s definitely a great yarn if you need a nice chunky throw to keep you warm :). Chain 81 (or any multiple of 10 plus 1). 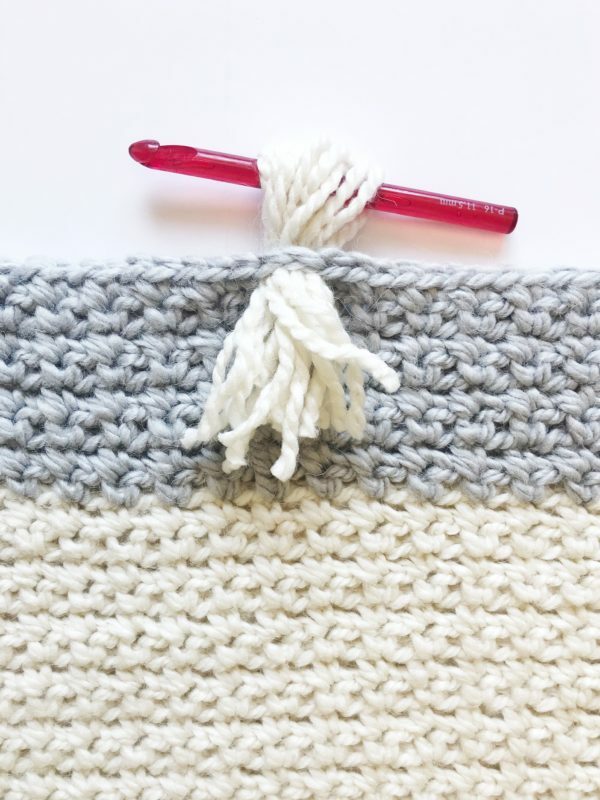 ROW 1: In the third chain from the hook, work a HDC (half double crochet). A HDC is YO, insert your hook, pull up a loop, YO, pull through all three loops on your hook. Continue to the end of the row. When you reach the end of the row, chain 2 and turn. ROW 2-3: Work 2 rows of HDC. (I am not counting the chain two as a stitch, so I am working into the first HDC from the row below.) Chain 2 and turn at the end of each row. ROW 4: HDC in the first 4 stitches. In the 5th stitch, work a DC3tog cluster. (YO, insert your hook, pull up a loop, YO, pull through two loops. YO, insert your hook into the same space, pull up a loop, YO, pull through two loops. YO, insert your hook into the same space again, pull up a loop, YO, pull through two loops. YO and pull through all four loops on your hook.) *HDC in the next 4 stitches, then work another DC3tog cluster. Repeat * to the end of the row. You should end with 4 HDC into the last 4 stitches. Chain 2 and turn. Repeat rows 5 through 8 until you have five cluster rows. 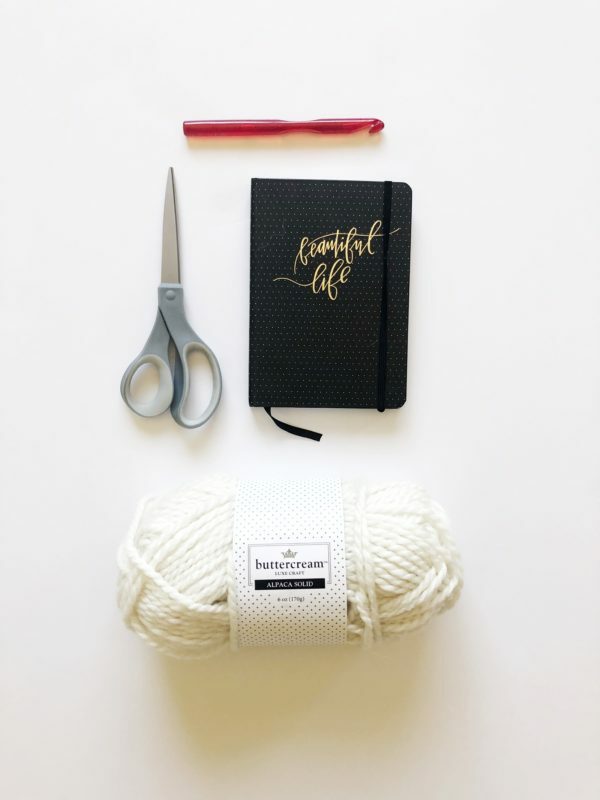 The middle of your blanket will now be all HDC. You can make this section as long or as short as you desire. For the length I wanted, I worked 44 rows before I started working the cluster rows again. When your middle section is at your desired length, you can start your cluster rows again. Repeat row 4, then work 3 rows of HDC, then repeat row 4, then 3 rows of HDC, etc, until you have 5 cluster rows with 3 rows of HDC in between each cluster row. 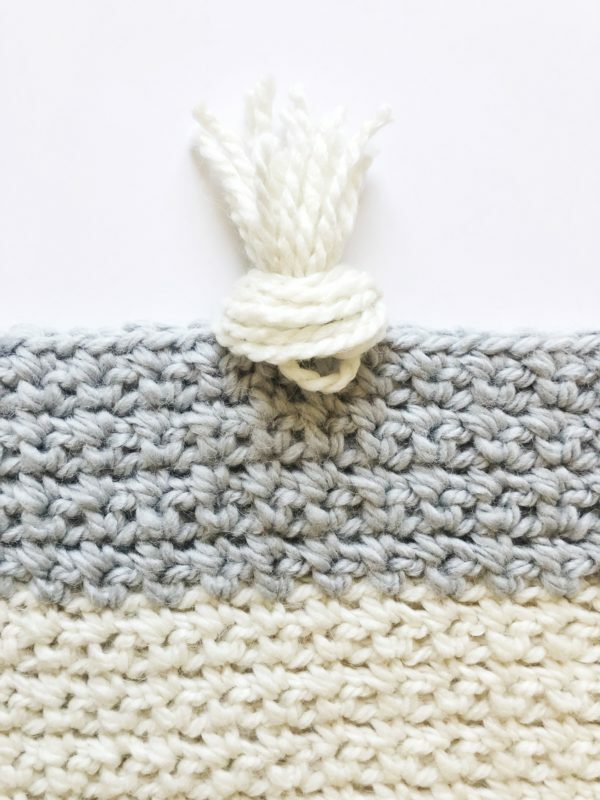 You should end the blanket with 3 rows of HDC. Something that helped me to make sure I always had 3 rows of HDC in between my cluster rows is that the clusters will only be showing on one side of the blanket, so the cluster rows should always be facing away from you when you are working a new cluster row. Also, remember that there should always be 4 HDCs in between each cluster so that the clusters line up evenly. After I finished the blanket I wove in all my ends with a tapestry needle and added some simple tassels. For the tassels I used the same simple tassel technique as my Crochet Modern Mesh Stitch Blanket. 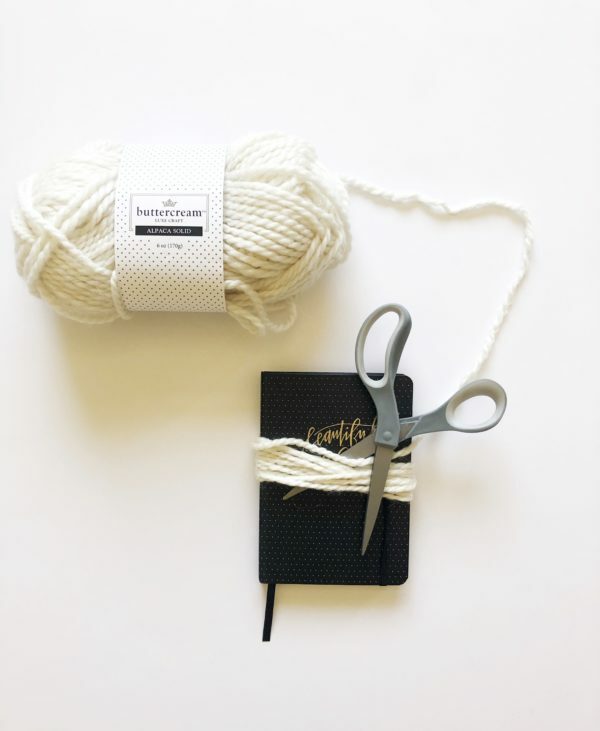 Wrap a piece of yarn around the notebook horizontally 10 times. Then cut the yarn in half. 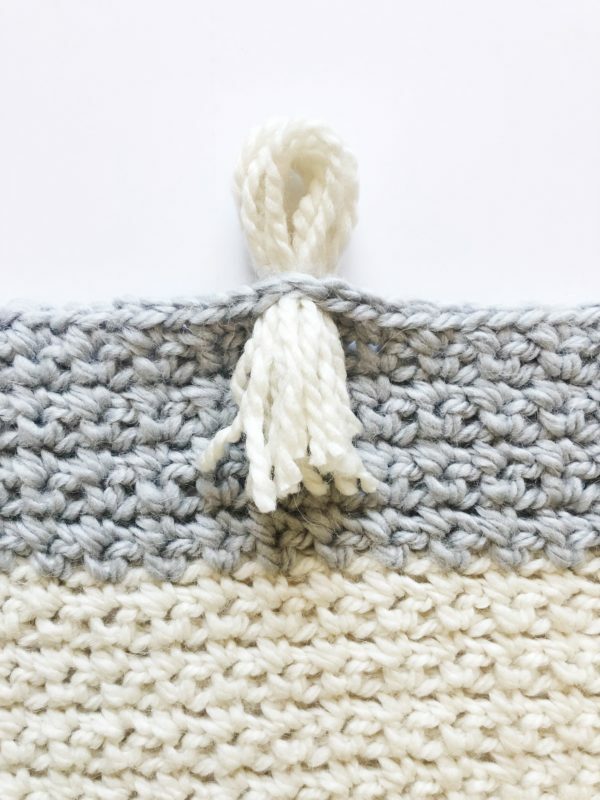 Take the pieces of yarn and fold them in half. Insert the folded end into the chain space above the starting chain. You can either do this just with your fingers or with a large hook – whichever is easier for you. For the Dotted Edge Throw I used 3 pieces of yarn for each tassel. Turn the yarn so that the loop is facing you. And pull tight to make a knot. Trim the ends to your desired length and to even them out. 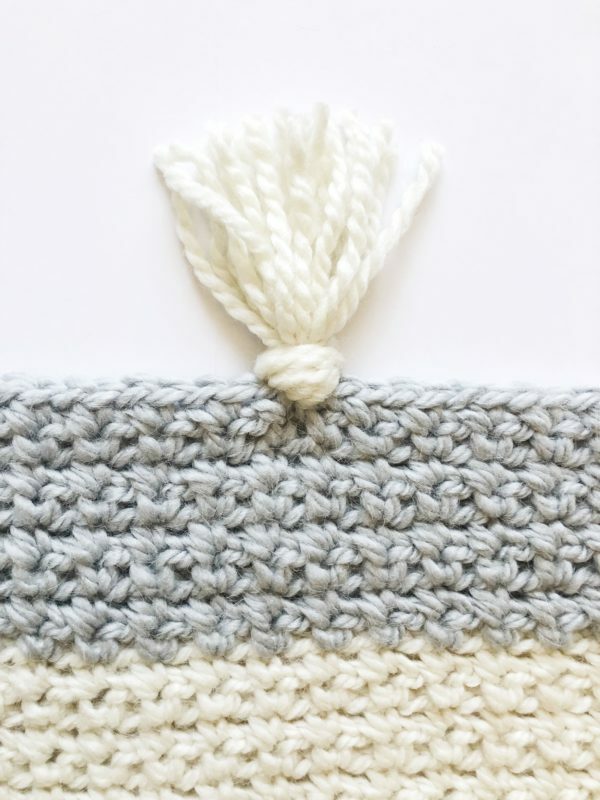 You can make your tassels as thick or as thin as you like and space them out however far apart you’d like. For the Dotted Edge Throw I spaced them about out every other stitch. Thank you so much for coming to read this pattern and best of luck with your project! When you finish I hope you’ll share your work on the Daisy Farm Crafts Facebook page or on Instagram using the #daisyfarmcrafts hashtag! We’d love to see!